You are here: Home > Rumor Alert: HTC One Mini Headed For T-Mobile Store Shelves? 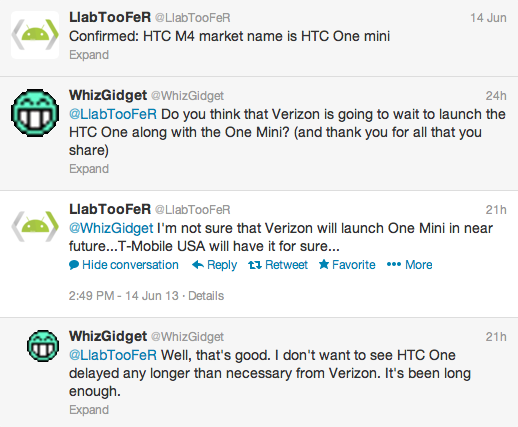 The HTC One Mini, the baby variant of the excellent HTC One is rumored to hit T-Mobile according to a noted HTC tipster. The One Mini is rumored to include a 4.3″ 720p display, dual-core processor, Ultrapixel camera, Sense 5 software and the same full-metal design as its big brother. Now, well-known HTC developer and insider @LLabTooFeR with insight into future roadmaps claims the device will be heading to T-Mobile sometime in the near future. The HTC One Mini is said to be one of two new HTC One variants coming out later this year including the HTC T6 aka the HTC One Max which is likely to compete with Samsung’s Galaxy Note III. Given the source of the information, we’re confident that there’s plenty of faith to be had in this story. I for one would welcome a device this size with open arms and I can only hope we see the HTC One Mini on Magenta shelves in the next few months. Nice. I really hope they price it around $350 or so, but more realistically it’ll probably be more around $450-500. This is good news for T-Mobile, as they need all the help they can get. actually they dont need any help, they are doing just fine, probably the best company right now ! T-Mo has dropped a large amount of subscribers over the past few years (I recall it being somewhere around 5-10 million) – they need to expand their network significantly to try and compete with AT&T/Verizon. 300 to 400$ and be available in several colors.!!! Possibly in the future. All of the Razr family of smartphones came out before the subsidies ended. It’s already been rumored that the Moto X will be coming to T-Mobile. I’d like if they get the T6 as well. I already own the HTC One but I’d definitely upgrade to a larger device if it came with the same build quality. As long as the One Max comes in an unlocked flavor with quad-band LTE, I’m upgrading to it. The only thing that might stop me from doing that is seeing what Moto brings to the table later this year. They should price it at $199 no contact…. If Nokia can sell the Lumia 521 for $129, how much more can it possibly cost to build this? Why would it be $500? That’s only $30 less than the S3. It wouldn’t sell at all. I guess the Nexus 4 has led you all to believe that T-Mo loves crazy mark-ups or something, because there’s no way in hell HTC would charge that much for it. I just can’t see a budget phone with no LTE going for that much unless T-Mobile and HTC want to see it fail hard. Budget phone? It will be a mid to high end phone. It will just be a bit smaller and slightly less powerful. Of course it will have LTE. HTC are not copying Samsung by crippling the device with terrible specs ala the Galaxy minis. I stand by my guesstimate of 450-500. The “Mini” versions of phones are typically $100 less, based off of past releases of multiple manufacturers. I don’t know how much this will be exactly, but I’m betting it’ll be in the low $400’s or so. Dreaming…these companies are dreaming that no one notices how they are ripping us all off. These devices don’t cost nearly as much to build to justify what they are charging. You’re the one who’s dreaming. The cost to build has nothing to do with the price. The price is what people are willing to pay. I agree that the cost to build isn’t as much as what we are paying – no one would make a profit if we paid that. Manufacturers have so much overhead (R&D, software programming, marketing, labor for manufacturing, etc. ), that it makes sense for them to charge much more than what they pay for the materials. This is rumored to have much better specs than the 521, so I’m betting it’s going to be in the high $300’s to low $400’s. And the mysterious Sony Xperia Z. On another note… the HTC One would be one of two Android phones I’d consider if I went Android. But, the One Mini would certainly be a nice addition. i really hope it’s not just the grey version. If only HTC would take this phone and put WP8 on it , it would be awesome. tmo does not have the htc one black edition and now an htc one mini. it might be the htc facebook phone. 4.3 inch is not Mini. Secondly, the photos, often seem like photoshopped One. My One-S is 4.3, it is not mini. Mini is where my kids can carry it in their pocket, needs to be 4 inch, small and light. (the Lumia 521 size). Yes, more 4 inch Androids please!!!! Their Flagship devices are 4.7 and 5.0 inches, so they are mini in comparison. Also, HTC is coming out with a Desire 200 that might be what you’d want – it’s a 3.5″ screen, but I can’t speak to anything else on it. I didn’t know about the S3 Mini, it’s not in the US at all? Maybe it’s coming. It launched as the new Galaxy Exhibit on T-Mo a week or two ago. Which is not the Exhibit 2 4G t679 on T-Mobile. (I hope from 2011) Is this new one LTE? Try not to confuse me, T-Mobile! Now I have to decide between a HTC One Max or a Note3. I will check out the stock HTC camera app features; HDR and Panoramic, before HTC draws me back. So far I love the Note2 cam features. The HTC One’s camera is amazing, imho. I’ve never had a camera phone with such a great camera (I’ve been attached to Moto phones, and then had a Nexus for a while, none of which would ever be competition for HTC’s camera). I suggest you check it out in a store – the One is an amazing device. This will probably replace the One S as it nears it’s EOL. So it’ll be like the Amaze, but with better Bluetooth and not on an orphaned hardware platform? Everyone was bashing the Galaxy S3/S4 “mini” naming convention but seems like it is OK for HTC to do this. I don’t know what HTC is becoming after the Amaze.. They started copying Apple by doing the non removable battery, no SDCard slot and the aluminum body recently on the one. And now, they are about to copy Samsung for the naming convention. They seem to copy the strategy that are successful. it’s ok for HTC to do this because as far as we can tell, this will have similar or better specs than the regular HTC One, just in a smaller form factor. The Galaxy S3/S4 Mini version pissed off alot of people because they shared nothing in common with their full-sized counterparts, except the name. The mini variants have worse specs, a poorer build quality, and are quite underpowered. The US version of the HTC One didn’t come with a micro SD slot because there wasn’t enough room after all the RF components were added. It has nothing to do with them copying Apple. It was talked about in an earlier article here on tmonews. IMO, Samsung shouldn’t be doing this because they already have several other low- to mid-range phones on the market with seemingly more being announced each day. HTC has their Desire line (two models this year), and their One line (according to rumor, it’s just the One [M7], One Mini [M4], and One Max [T6]). This would be great. I can finally upgrade my girlfriend. Damn that didn’t come out right. Any updates yet on whether or not this will be coming to T-Mobile? Euro Tmobile has it on their site, so I can’t see why this shouldn’t be available sooner than later. I am personally waiting for it. I want to get rid of HTC One and get the mini. I’m a girl so it’s just too big for my hands and my purse half the time.